Contrary to popular assumption, the print industry is far from dead. Paper materials and documents will continue to play an important role in many areas of business. However, with so many people focusing on the digitalization of content and communication, it can be difficult for printing companies to feel confident in the guarantee of a steady stream of customers. But, as with all types of business, success hinges on appealing to the right audience. To optimize performance, drive revenue and expand operations, it is imperative for printing providers to follow emerging trends and utilize the most effective marketing strategies available. And, right now, that means attracting millennials. This may be confusing to some. After all, people categorized into this group, or those currently between the ages of 18 and 34, grew up with the Internet. They are used to connecting and communicating through screens and accessing the goods and services they need through digital devices. But it is crucial that print marketing professionals today understand that millennials think, act, work and behave much differently than previous generations. And some of these behavioral trends underline the advantageous opportunity companies have to catch their attention. As we have talked about before, a handful of studies and research over the past few years have revealed that younger generations actually prefer print materials to electronic ones, especially in certain situations. For example, the majority, or 92 percent, of college students would rather read paper-based textbooks than eBooks. In addition, Iron Mountain recently reported that, according to research conducted by JWT, more than 80 percent of adults in the United States would choose reading magazines in a tangible rather than digital form. There are a number of reasons to explain this. When interacting with educational and informative materials, many people believe they are able to concentrate better with tangible paper in their hands. 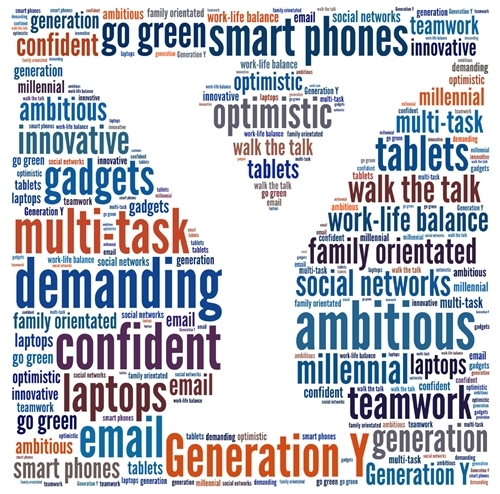 Considering that Generation Y now accounts for the majority of the workforce in America, as well as representing the largest consumer demographic, this concept is particularly relevant for businesses today. That is not to say that digital channels are not an effective platform to market on but, rather, that technology should be used to supplement print and paper media. Certainly, acknowledging the tech-savviness of the millennial generation is essential for printing service providers. One of the aforementioned behavioral differences between age groups is that millennials are used to having their need for instant gratification satisfied. As digital developments continue to dominate the world around us, consumers are presented with an increasing number of platforms to find the solutions they need, when they need them. This is where the speed and efficiency of print companies comes into play. With younger people rapidly assuming leadership and decision-making roles, sales experts will find themselves interacting more with this age group. One area of opportunity that printing service companies can capitalize on is the general impatience of the millennial generation. A study conducted by Quocirca found that 40 percent of businesses are planning on investing more financial resources in automating workflow processes. Because millennials value speed and mobility, to successfully market to this audience, it is highly recommended that printing companies focus on delivering innovative, adaptive and flexible services and solutions that support the "on-the-go" mentality. This demographic has high expectations for organizations, so it is imperative that print professionals are also able to offer them the best-in-class systems that guarantee quick and quality solutions for paper goods. To do so, businesses should partner with a third-party distributor that can provide sophisticated and integrative software, applications and portals that streamline everything from inventory management to advanced shipping notifications. Although the Internet of Things will continue to be a priority for business operations, marketers should also remember that print media is especially effective on this generation because, simply put, they aren't targeted through that channel very often. And while the majority of corporations are competing to grab people's attention online, printing service providers are left with a wide-open window of opportunity to catch their eyes in a less-crowded space.